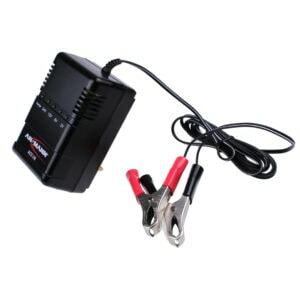 There are many types of battery chargers on the market and indeed we offer our fair share of them, therefore choosing the right battery charger can be daunting. For the purposes of this notice, I will assume that you only have the very basic idea of what you want. We offer chargers that will charge NiMH batteries both consumer type individual cells like the AA, AAA , C, D and PP3 and also Custom Battery Packs consisting of multiple cells from 1 to 10 cells. We offer chargers made by Duracell, Ansmann and GP Batteries. We also offer NUMAX Lead Acid Battery Chargers designed for lead acid batteries from 1- 120Ah. We also offer some Ansmann Lead Acid Chargers. We also offer Rechargeable Lithium Battery Chargers, the types that will charge the majority of digital camera and mobile phone batteries. One made by Ansmann and one by Uniross. Decisions can be made on number of features, on cost or on brand. In my opinion if you buy the best you can afford, you will save money in the long run. I will add a further post about the features fairly shortly.